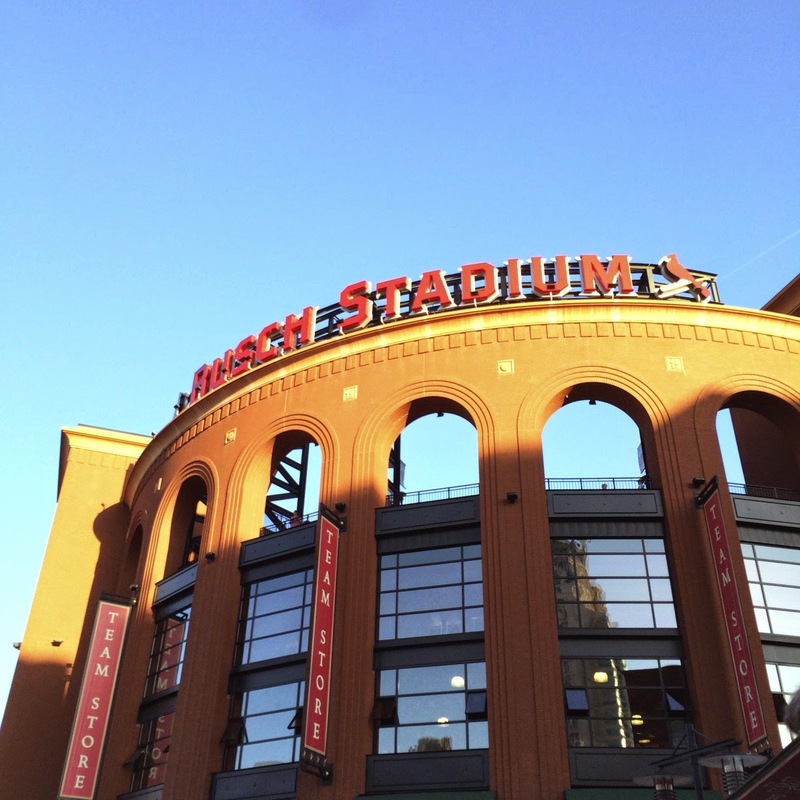 So when I originally titled this post, "First Cardinals Game" I thought it may be a bit misleading, that I'd be blogging about Patrick's first Cardinals game. Well, sadly, this isn't about Patrick's first Cardinals game--parents of the year here haven't taken him to one...yet. Hoping later this summer we can bring him and I'll be snapping pics like crazy and then blogging all about it. 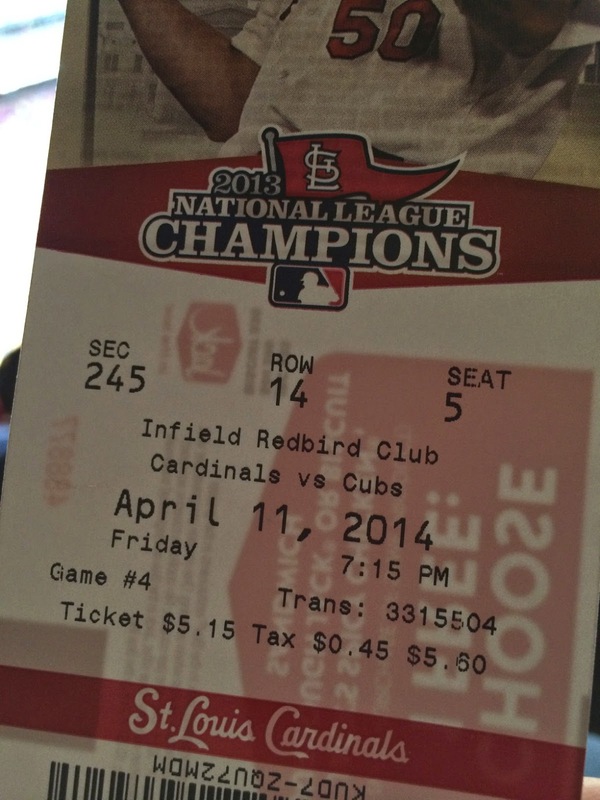 Until then, this post is about MY first Cardinals game of the 2014 season. Woo hoo! It was really crazy how this first game came about: my parents had just gotten back from a trip to Orlando--part business trip for my dad, part vacay for them both--and my mom called and said she and my brother Ben were going to stand in line Friday morning to try and get "first pitch" tickets. 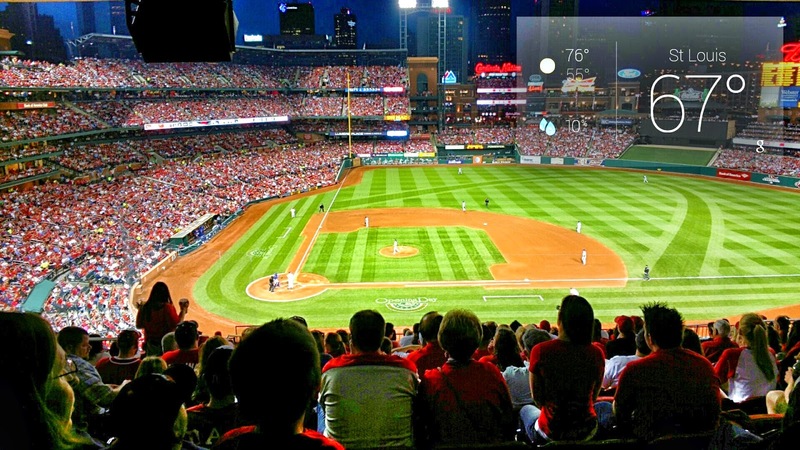 Basically, for every game day during the regular season, the first 275 fans to visit the Busch Stadium 8th Street Ticket Windows will be able to purchase a pair of tickets to that day or evening's Cardinals game for just $11.20! So they were able to get tickets Friday morning; however, the catch: you don't know what seats you're going to get until you go pick up your tickets 15 minutes before the game starts. So my mom offered to watch Patrick so my dad and I (Mike had to work, booooo) could go to the game. 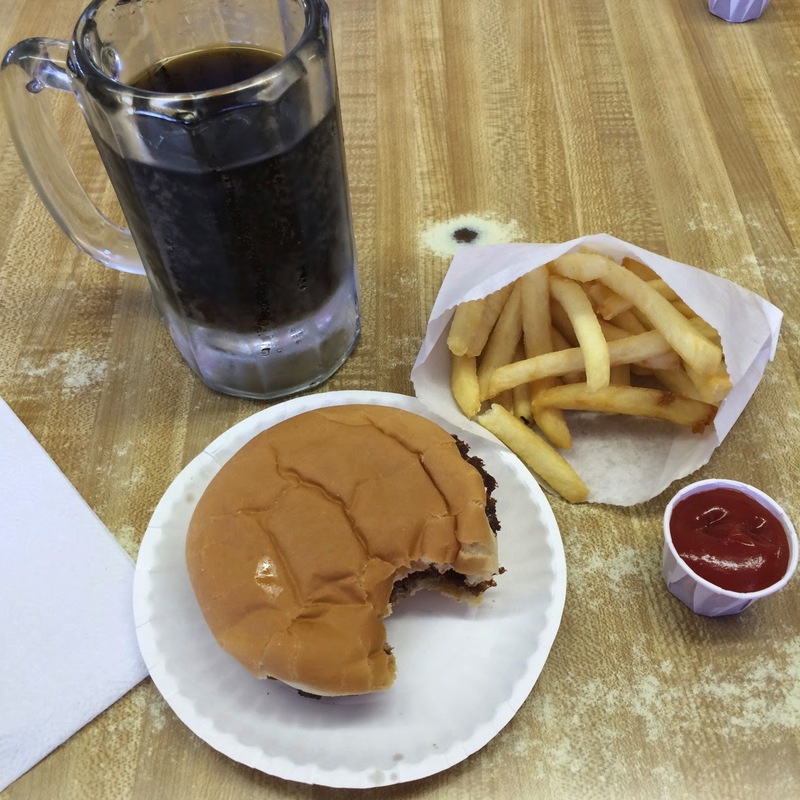 Well, keeping with our family tradition, we hit up Carl's Drive In in Brentwood on the way. OMG. Their food is to die for! I could have eaten double this amount! But I resisted: I knew I could get a snack at the game. My dad and I agreed that we'd get down there a bit early so we could check out the new Ballpark Village next to the stadium. We also agreed that if we happened to get standing room only tickets we'd just go home and watch the game--we both weren't into standing for 3 hours (LAZYYYYY!!!). We met up with my brother Ben and his wife Erin in line to collect our tickets. It was kind of exciting: you give them your voucher that you got (my mom) early in the morning, and then they hand you an envelope with your tickets in it! It doesn't matter what number you are in line; all of the envelopes are completely random. Anyways, so once we got into the stadium we open up our seats and we were shocked: both my dad and I and my brother and his wife actually got REAL seats! And they were in the Redbirds Club too! And, they were NEXT TO EACH OTHER! What are the chances of that?! Apparently, very rare, since the envelopes are shuffled and usually the majority are standing room only tickets. Anyways, we were shocked and excited that we not only had seats but they were next to each other! WIN! Did I mention they only cost us $11.20 for both seats?! And, since we're crazy like this, we totally looked up how much these seats usually are for a Cards-Cubs game on a Friday night ($80 a piece!!). I had some leftover Cardinals bucks from a gift last season, so I treated my dad and I to some nachos and a soda. I did bring my Google Glass, so I snapped a couple fun pics during the game and enjoyed asking Glass what I was watching and it giving me the live score and such of the game I was watching. That was cool. 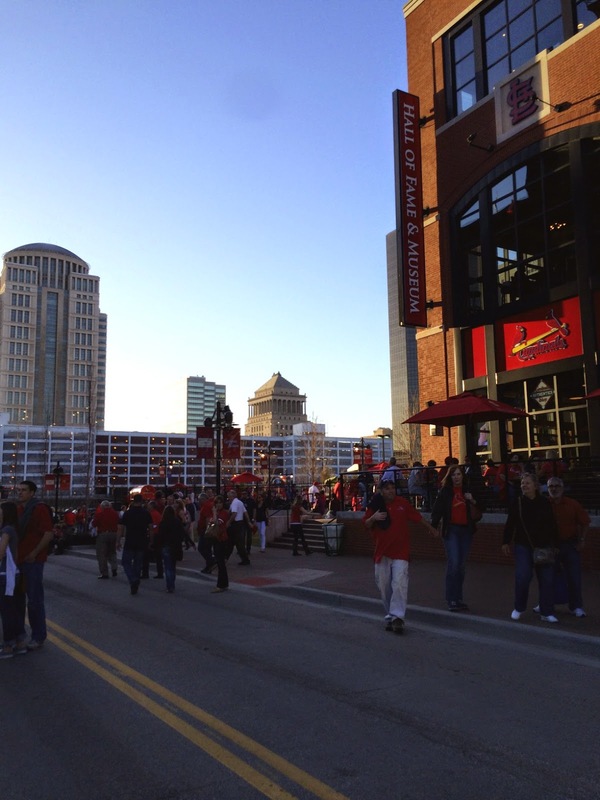 Despite the Cardinals not winning, it was a fun evening and we had gorgeous weather. Plus, it was a CHEAP (father-daughter) date night! We got to park for free (trade secret with that one, sorry folks :), had snacks at the stadium for free, and then each paid a little over $5 for some great seats. All in all it was a great first game of the 2014 season! Although it was nice to go with my dad, I can't wait to go back to a game with Mike and Patrick later (hopefully not too much later!) this season. Go Cards!